This is a guest post from my husband. He runs a local gaming forum and frequently posts reviews for video games, board games, and roleplaying games. If you want to check out more of his reviews take a look at the Windsor Gaming Resource. I’m a gamer. I play all kinds of games, from pen and paper RPGs to card games to board games to video games. I am also a father of two beautiful girls. Like any parent I love spending time with my kids. What’s even better is when I can spend time doing the things I love with them and sharing my interests with them. Of course in this regard I’m talking about gaming. Traditionally games for kids were made overly simple. Games like Chutes and Ladders or Hi-Ho Cherry O where there is no decision making and each turn is just rolling the dice or spinning a spinner. While these games may be great for the kids, they are boring as heck for us parents. Thankfully with the rise in popularity of gaming in the last few years (especially in the areas of board and video games) this has started to change. Right now is a beautiful time to be a gamer dad (or mom for that matter). There’s a great selection of stuff out there that the entire family can enjoy. Stuff that’s not only simple enough for the kids but has enough added complexity and decision making to be fun for parents. Today I’m going to point out a few games that I have found to be awesome to play with my kids, and which don’t bore me to tears. I’m going to focus on what are probably my three favorite types of games: roleplaying games, board games and video games. By roleplaying games I’m talking about a game where you take on the role of a character and play through an adventure. During that adventure you get to decide what exactly you want to do and you have the opportunity to improve your character in some way. In the last year Lego has provided us with the perfect gateway into RPGs for our kids. That is Heroica. 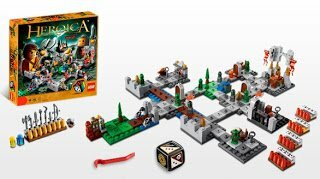 Heroica was released this year as part of the new Lego boardgame series. What sets Heroica apart from other games in this series is its RPG elements. In these games you build an encounter area. This is a dungeon, forest, dessert or other adventure location. You fill it with treasures and monsters and decide on a goal. Goals can be to beat a certain monster or to get a certain treasure. Once set up the players pick a character and start the adventure. Each character is different and has a special skill. For example the Barbarian can defeat every enemy adjacent to it with a sweeping attack. Once the characters are picked out players play in turn by rolling a die and moving their pawn. Moving next to a monster starts a combat which is also resolved using a die roll. Each set also contains some special encounter type. One set has magical doors that can only be opened by standing on the right spot another has cave-ins that you have to roll to get past. During the adventure players find items and gold. Gold can be used to buy better equipment. Overall this simple game includes all of the basic RPG elements. Adventures, characters and character improvement. The rules are simple enough that even my 4 year old understands them. I will admit the pieces are a bit small for her and dangerous to leave out around her little sister, but it’s no problem with me making up the maps and then us playing through together. My daughter absolutely loves these games. After playing she will go on for a day or two about how her Wizard killed the Rock Guy (Golem) with a Spell! There are currently 4 different Heroica sets out on the market at a variety of price ranges. Each contains two set adventures and of course being Lego they can be easily changed up and combined in an infinite number of ways. As noted above, I’m not a fan of the traditional kid’s boardgames. They just aren’t fun. We’ve tried a variety of the favorites and found nearly all of them to be boring, not just for us either, the kids seem to loose interest pretty quickly as well. Enter Blue Orange games. Blue Orange Games produces a pretty extensive line of extremely well made kid’s games. Two of my favorites so far are Bendomino Jr. and Bingory. Both of these games come in a sturdy brightly coloured wooden box with a slide off lid. The components inside are just as nicely made with real wood pieces and a cloth bag with Bendomino Jr. Each contains an easy to read simple to understand rulebook. As I’ve already gone on longer then I expected with this I will keep this short with two quick recommendations: Cooking Mama and any Katamari Game. Cooking Mama is available for the DS and the Wii. I personally much prefer the Wii version. In this game you work with Mama to create a huge variety of recipes and get scored on how well you do. Each creation requires the player to play through a series of mini games. 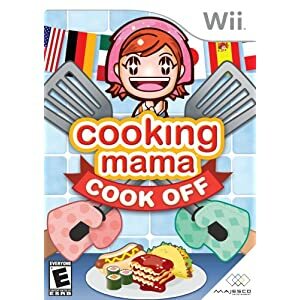 What is brilliant about this game is the way the Wii remote is used to simulate the actual motions used in cooking: from sliding it back and forth to cut, to spinning it to stir (Note: a full review of Cooking Mama was posted previously). 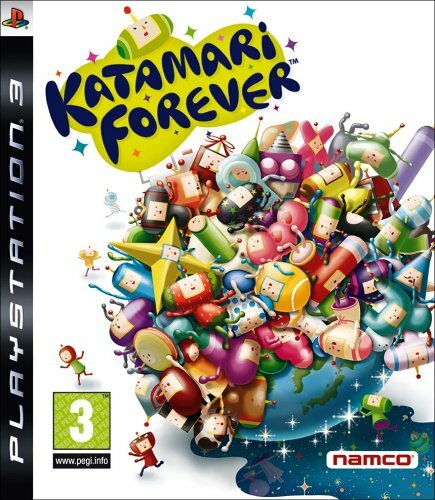 Katamari is an extremely odd extremely Japanese game where you control a small character, the Prince of the Universe, and use him to roll a big ball all over the place. As you roll this ball it picks up things it touches. As it picks up things it gets bigger and the bigger it gets the more things you can pick up. So for example you may start in a kid’s room picking up paper clips and erasers, eventually growing big enough to pick up the entire house, backyard and fence. It’s a very odd very fun game that my 4 year old instantly “got” and was able to pick up and play. Sure she doesn’t usually hit the goals for each level but she has a ton of fun rolling around picking stuff up. The game is available for a variety of systems including the Playstation one two and three, the Xbox 360 and even the PSP. Each game is different but the basic gameplay is the same. I have a great time with this one as it’s a game I’ve loved since the PSOne edition and it’s awesome that I can now take turns playing it with my daughter. So that’s it for now. These are a selection of modern games that aren’t only great for your kids but fun to play as an adult. I personally love passing my love of gaming on to my kids and hope you can enjoy doing the same.Do you have any favourite games you like to play with the family?